Whereas the eastern white cedar can grow to 15 to 20 metres tall, its western relation, the western red cedar, can reach a whopping 60 metres. Both can live several hundred years. If the tree has been growing at high altitudes and on cliffs and in cracks where root growth is limited, however, it appears stunted, like small shrubs. They both have green scaly leaves, and their mature bark is brown and stringy-looking. Their seed cones are both small – about one centimetre - but the western species has outward turning points at the end of the scales, whereas the eastern species’ scales are rounded at the tips. Range: The species Eastern arborvitae typically grows from southeastern Manitoba right through to New Brunswick and the western portions of Nova Scotia and P.E.I. The other Canadian species of Thuja is the western red cedar (Thuja plicata), a huge tree that grows along the coast of British Columbia and the wetter areas of the Interior, near the province’s eastern border with Alberta. Habitat: The species Eastern arborvitae prefers moist soil so it can be found along shorelines and in swampy areas, though it also occurs in dry areas where the soil is not acidic, such as on limestone. You can grow young trees by collecting and planting seeds in the early autumn, when they would naturally fall to the ground from their dry brown cones. Plant in a cold frame or straight in the garden, covering with only a light sprinkling of soil. You should see young plants growing the following spring or summer. Their first leaves will be needle-like, but in time you will see true leaves forming that have the typical scale look of cedar. Keep the seedling in partial shade for the first year or so. Both Thujas provide invaluable shelter to a host of birds and mammals all year long. As for food, cedar seeds feed squirrels and a variety of birds including pine siskins, juncos and redpolls. Snowshoe hares and deer nibble on cedar leaves and twigs to help them survive winters. Although I always loved nature, it wasn’t until I was in my early 20s that I started paying it more serious attention. In addition to birds and the flowering plants on the woodland floor, I tried my hand at identifying the trees around me, beginning with the ones I saw most often. To my surprise, I discovered that one of the towering trees in my local woods was one I had grown up with all my life, albeit as a hedge. The eastern white cedar, Thuja occidentalis, had been there all along, catching the balls that rolled off my basketball court (a.k.a. driveway), providing the perfect secret hideaway and being that constant green background that kept my father busy trimming each summer. I then began noticing it everywhere, both as hedges and as small rounded trees. The most remarkable ones I remember, however, were those growing in some woods I used to explore in the Ottawa greenbelt. They were about 10 metres tall, maybe more, and all their lower branches, the ones at my height, had fallen off or were bare. As they were clumped together, it was like walking off the trail and into a living cathedral, complete with tree trunk pillars, high ceilings and soft light shining through the leaves. This species, also called eastern arborvitae, typically grows from southeastern Manitoba right through to New Brunswick and the western portions of Nova Scotia and P.E.I. Due to its preference for moist soil, it can be found along shorelines and in swampy areas, though it also occurs in dry areas where the soil is not acidic, such as on limestone. The other Canadian species of Thuja is the western red cedar (Thuja plicata), a huge tree that grows along the coast of British Columbia and the wetter areas of the Interior, near the province’s eastern border with Alberta. Also called giant arborvitae, it is British Columbia’s provincial tree. Canada is home to two other plants that bear the name “cedar.” Both belong to different genuses and have different characteristics. One is the eastern redcedar (Juniperus virginiana), found in a few spots in southern Ontario and even fewer in southern Quebec. 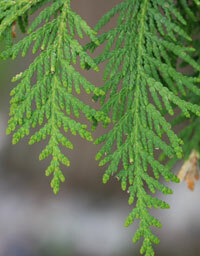 The other is the yellow cedar (Chamaecyparis nootkatensis), which grows along the coast of British Columbia. Although its leaves are similar in that they have scales, the eastern red cedar is a form of juniper and has berries instead of seeds. The yellow cedar, also called Alaska cedar or nootka cypress, has small cones like those of Thuja, but its cones are more rounded, and each scale has a point that sticks out along its back. Aboriginal tribes have used these two trees in a myriad of ways, from treating infections and other maladies with oils, ointments and teas, to weaving inner bark into clothing, to making teas rich in vitamin C from the foliage and carving huge totem poles and canoes from the light rot-resistant wood. European settlers also found many uses for this tree, from broom handles to poles to the zigzag cedar rail fences that still line many a country road. 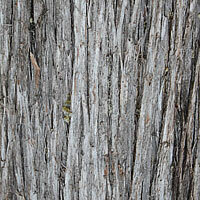 Cedar is currently used for products such as lumber, roof shingles and essential oils. Caution: We are not recommending the use of these plants for medicinal or food purposes. Many plants are poisonous or harmful if eaten or used externally. The information on food and medicinal value is only added for interest. The accuracy of this information has not been tested. Alternatively, if you have a lower branch that easily reaches that ground, bury a part of it with some soil, using a rock to hold it in place. After it roots, snip off the branch that has rooted and plant it elsewhere. 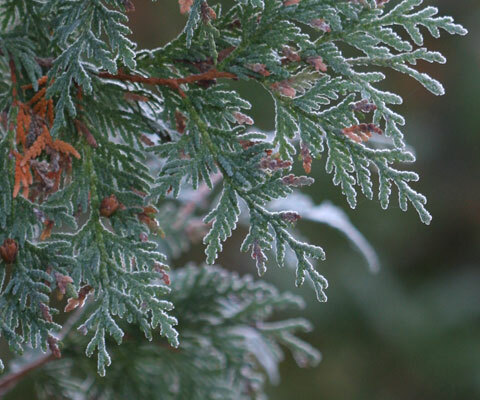 Although cedars typically prefer sun and are best grown in the open, they are somewhat shade tolerant. Give them moist, rich soils that are well drained for optimum health, but if your garden soil is different don’t be afraid to plant and see what happens. I have some growing in clay at the back of my garden and they do quite well. In winter, young trees that would have a hard time surviving repeated browsing by deer can be wrapped in burlap. Larger established trees won’t need this protection, and while you may even notice a straight line at the bottom of your cedar trees where the deer have reached up and nibbled the tree will be big enough to thrive.